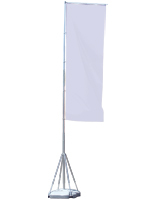 Flag Pole Sign Supply On Sale Today! Attract Customers' Awareness With These Massive Outdoor Sign Supplies That You Can Customize With Flags! In Stock Now In Our Fast Ship Warehouse! 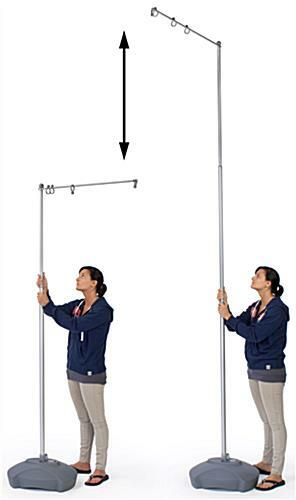 This sign supply that suspends banners, likewise known as flying pennants, brings the most visually enticing facts to life by towering ten (10) feet in height. 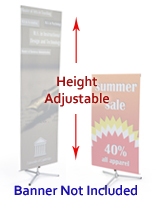 Like the retracting banners, the occasion showcases are longstanding and long-lasting. This first-rate sign supply that advertises businesses, companies, occasions, specials, or info is great for people searching to put their name out there in a big way. Printed graphics with a special or enticing design will embellish the worth of this special merchandise (see related preferences on right side). 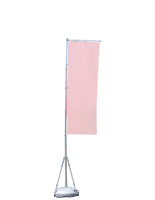 The durable sign supply for sale online is made from molded acrylic and metal and has acrylic hooks to clamp your flag's grommets into place. The base has the option of being filled with sand or water to weigh it down in the course of windy climate. The sign supply that towers over crowds of people is incredibly light, simple to put together and disassemble to save time. This sign supply is an effective means to publicize a business at an occasion or event! The showcases will entice possible clients, consumers, and customers. This sign supply with telescoping poles, also recognized as an occasion showcase, feature a flying design that will attract client awareness. If your business has an occasion and needs to get a publicizing medium, this rack permits clients to fasten printed pennants with comfort. This exterior sign supply with water base means that this giant flying design can be exhibited outdoors for ideal promotions. These pennant showcases are optimal for exhibiting graphics about sales, merchandise, or servicing facts and can be observed at major venues like museums, functions, occasion exhibits, shops, and several others.